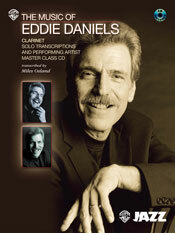 Check out Eddie’s book: The Music of Eddie Daniels: Solo Transcriptions and Performing Artist Master Class CD. Eddie has chosen 14 compositions in various styles of Latin, jazz, classical and ballads to demonstrate and share his technical, improvisational, and compositional skills. His book provides an opportunity to study and learn clarinet techniques and improvisation techniques along with melodic, harmonic and rhythmic jazz vocabulary. The Performing Artist Master Class CD includes excerpts of Eddie’s transcribed solos, instrumental examples/demonstrations and an in-depth discussion by Eddie and transcriber Miles Osland on the following topics: Classical and jazz styles, technique, articulation, odd phrases, playing jazz standards, influences, composition techniques, collaborations, and improvisation. You can purchase the book through your local music dealer or go to www.alfred.com.